The BJP legislature party met here today to chalk out strategy to take on the ruling Congress during the month-long Assembly session, beginning February 21. Senior party leaders, including state BJP chief Suresh Bhardwaj, former Chief Minister P.K. Dhumal and Mr Ramesh Chaudhary, attended the meeting. As the vulture population hovers on the brink of extinction, the Himachal Pradesh Government has embarked on a plan to breed the nature’s scavengers in captivity. The Himachal Pradesh Government has decided to charge a nominal maintenance fee from tourists coming to the popular tourist destinations in the state to keep these clean and ensure their proper upkeep. The prolonged spell of inclement weather, which saw frequent spells of snow, sleet and rain, has spoiled the entire ice-skating season this winter. Expressing concern over the pitiable condition of Dalits in the state, Mr Chaman Lal Ghacli, Chairman of the Bhartiya Sahitya Academy, has critised the law and order report presented in the last state Assembly session. The Himachal Pradesh Government has made enormous strides in establishing and strengthening the animal health infrastructure for catering to the needs of about 52 lakh livestock wealth of the state in a big way. The Himachal Pradesh Trained Graduate Teachers Association has condemned the state government regarding the final selection of the candidates of the JBT and trained graduate teachers (TGTs). Hundreds of youngsters thronged the Upper Bazaar here when they came to know that leading filmstars Syed Julfi of film Pyasa and Shabir Ali of Ab Bas are in the town along with producer Ramesh Sharma. The actors and Ramesh Sharma visited various shops. Actors Syed Julfi and Shabir Ali in Hamirpur on Thursday. The BJP legislature party met here today to chalk out strategy to take on the ruling Congress during the month-long Assembly session, beginning February 21. Senior party leaders, including state BJP chief Suresh Bhardwaj, former Chief Minister P.K. Dhumal and Mr Ramesh Chaudhary, attended the meeting. Discussions were held on various issues to be raised during the session, including the deteriorating law and order and financial position of the state. The resignation of former Education Minister Asha Kumari also came up for discussion as majority of the leaders felt that it was only under political pressure from the BJP that the Chief Minister was forced to remove her from his Cabinet. They, however, felt that all possible attempts were made by the Chief Minister to shield her and she should have tendered her resignation much earlier. Some of the legislators raised the issue of alleged disrespect shown towards BJP legislators at various functions of the Chief Minister during his winter sojourn of the lower parts of the state. Expressing resentment over the denial of opportunity to raise problems of their area before the Chief Minister, the MLAs decided to raise the matter in the Assembly. The BJP also decided to seek a detailed report from the government on the number of projects started and its budget allocation. The party claimed that many of these schemes and projects were completed during their regime and the Congress was now taking credit for it. The BJP will also raise questions on the allotment of industrial plots, packages and other benefits extended to industrialists from outside the state. The failure of the Virbhadra Singh regime in getting special financial package from the Centre is likely to come up for discussion during the coming Assembly session. As the vulture population hovers on the brink of extinction, the Himachal Pradesh Government has embarked on a plan to breed the nature’s scavengers in captivity. For this, the government has got permission to capture vultures. Talking to The Tribune, Mr A.K. Gulati, Additional Principal Chief Conservator of Forests (Wildlife), Shimla, says the department has got permission to capture 100 vultures. “The Ministry of Environment and Forests has allowed the Himachal wildlife wing to capture 25 pairs each of white-backed and slender-billed Gyps vultures from their natural habitat,” says Mr Gulati. He says the breeding centre will be set up at Saini Majra village in the Nalagarh area of Solan district. The vultures, which figure in Schedule 1 of the Wildlife Protection Act, 1972, have been listed in the International Red Book as highly threatened species. While scientists of the Bombay Natural History Society (BNHS) will take care of the centre, the UK-based Royal Society for the Protection of Birds (RSPB) will fund the project. 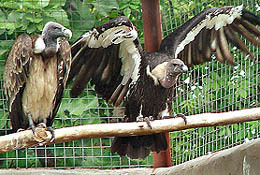 The RSPB is already funding vulture captive breeding centres in Haryana and West Bengal. The wildlife wing will only provide infrastructure and supervisory staff. However, an MoU between the Himachal Government and the RSPB is still to be signed. The Himachal wildlife wing has already carried out captive breeding of Western tragopan and cheer pheasants. Both these species fall in the category of endangered species of birds. The vulture population is declining drastically due to many reasons, including the veterinary use of drug diclofenac. Dr Lalit Mohan, Conservator of Forests, Wildlife, Shimla, who has recently attended a training programme on the conservation of endangered species in the UK, believes scarcity of food could also be responsible for their decline. Nowadays people generally bury or burn their cattle from hygiene point of view and the vultures have to depend upon carcass of stray animals. In an interview with The Tribune, the Tourism Minister, Mr G.S. Bali, said that the system would be initially introduced in Rohtang, Kufri, Khajjiar and McLeodganj and could be eventually extended to other tourist places as well. “The Tourism Department has been asked to formulate a detailed proposal on this so that it could be implemented effectively to promote tourism in the state,” he said. “Both foreign and local tourists spoil the beauty of these places by littering leftovers of eatables and polythene bags and this is the only way we can keep these tourist destinations clean. The fee would also be used for providing other essential services like ambulance and basic amenities,” he added. The exact amount was still to be decided but I could assure that it would not be unreasonable considering the services that would be provided to the tourists, said the Tourism Minister. An official of the Transport Department said that located 22 km from Shimla, Kufri was definitely the top priority of tourists coming back from Shimla, also because of the facility of skiing there. “We have been receiving feedback that the widespread litter left by the tourists definitely dampens the spirits of those going there to enjoy natural beauty,” he said. “Similarly, Rohtang is only 35 km from Manali and most tourists make it a point to visit both places,” he added. Mr Ashok Chand, owner of Nature View Hotel in McLeodganj, said that more than 40,000 tourists were hitting the town every year and with nearly 80 hotels, it had developed into a tourist destination from a mere transit point. “But if you walk down the main market, the stinking drains and garbage dumped on roadside forces you to hold your breath,” he said. “Tourists will not mind paying even up to Rs 100 in case they know that the money would be used to keep the tourist spot clean and hygienic. Places like Rohtang and Khajjiar desperately need such a move by the government. The government should also think of desilting the Khajjiar lake,” said Mr Dheeraj Aneja, a tourist agent. Echoing his views, Mr Kamlesh Kumar, a tourist from Delhi, said that he would not mind paying a nominal amount as maintenance fee. “What’s the point in coming to Himachal if we were to be greeted by lots of litter and garbage all over the tourist destinations,” he said. While the weather God obliged the ski lovers with adequate snow, the ice-skating enthusiasts were left disappointed. A meagre 29 sessions were possible at the Asia’s oldest natural ice-skating rink during the season. The season, which normally concludes in the first week of February, virtually came to an end in mid-January. The last session was held on January 16 and with weather playing truant the Shimla Ice Skating Club, which manages the rink, has officially closed for the season. On average about 65 to 75 sessions are held during a moderate season and the number crosses the three figure mark if the weather God obliges with an exceptionally good season. The extent to which the unfavourable weather conditions have affected the season could be judged from the fact that the club could not even organise the annual winter carnival at the Gymkhana. It was a bad year from the very beginning. Normally ice-skating starts around November 25 and the season officially commences from December 1. This winter the conditions were not conducive for water to freeze naturally and as a result there was a delay of almost three weeks. The first session was possible only on December 12. As water is frozen naturally under a open sky to form a thick sheet of ice on the rink the weather plays a crucial role. The lack of adequate number of skating sessions has affected the financial health of the club. Only about 250 members were enrolled for the season as against the normal strength of over 400 members. As a result the earning of the club dwindled almost by Rs 1 lakh. During 1960’s even 120 to 150 sessions were possible and the season extended to almost four months. However, with the “queen of hills” degenerating into a concrete jungle, there has been a sea change in the micro-climate. The minimum temperature, which even dipped to minus 13 degree celsius, hovers around the freezing point these days making it difficult for water to freeze naturally. As the day temperature mostly remains quite high only a few evening sessions are possible. Addressing a press conference at Parwanoo last night, Mr Ghacli, who was also the former Vice-Chairman of the State Scheduled Caste and Scheduled Tribe Corporation, said the report did not cover cases of atrocities on Schedule Caste people in the state despite many incidents of crime and oppression against the Dalits. Neither anyone from the treasury Bench nor from the Opposition had assessed the condition of Dalits in a true manner, he pointed out. The political parties in the state were no longer serious about the uplift of Dalits, he alleged. The Congress and the BJP used to exploit the Dalits for political mileage but never bothered to take the issues related to the Dalit class seriously, he said. The Dalits in the state were subjected to exploitation, he alleged. The temple issue of Santokhgarh in Una district was the outcome of such cheap politics, he asserted. He said though the Chief Minister, Mr Virbhadra Singh had taken some good steps for the Dalits but the need of the hour was to sincerely review the plight of the Schedule Caste people in the state, he said. Lashing down at Mr Sukh Ram for exploiting the Himachal Vikas Congress (HVC) for his own gains, Mr Ghacli said that his vested interests had defeated the purpose to establish a third political force in the state. Answering a query, Mr Ghacli, who was a senior leader of the HVC, said Mr Sukh Ram vetoed the unanimous resolution of the merger of the HVC with the Congress purely for his personal benefits. The induction of Mr Sukh Ram into the Congress was still pending with the Congress high command. Disclosing this here today, Mr Harsh Mahajan, Animal Husbandry and Housing Minister said specialised veterinary service of surgeons, pathologists and medical specialists were available in the veterinary polyclinics. For the prevention of highly contagious animal diseases, prophylactic vaccination against ‘foot and mouth’ disease, haemorrhagic septicemia and black quarter was being done through the network of these institutions besides undertaking regular dipping and drenching of animals against ectoparasites and endoparasites, Mr Mahajan said. “For keeping a check on the health status the animals entering Himachal Pradesh from the neighbouring states, four veterinary check points are working at Milwan in Kangra district, Swarghat in Bilaspur district, Pandoga and Mand in Una district and in the event of any outbreak of disease, two fully-equipped disease investigation laboratories located at Kamand in Mandi district and Shimla undertake disease diagnosis work swiftly. This disease investigation work helps in arriving at a definite diagnosis of the disease thereby allowing rational treatment on modern scientific lines and save farmers from huge economic losses”, claimed Mr Mahajan. “In order to monitor and cater to the disease surveillance work in the state, an epidemiological unit had been established at Shimla which keeps close watch on the outbreak of diseases and takes timely action to combat further spread of disease”, Mr Mahajan asserted. Mr Mahajan informed that through the network of these animal health institutions, 22,43,508 animals were treated for both contagious and non-contagious diseases last year besides castrations were performed on 2,74,163 animals, 12,55,701 animals were dewormed and 10,83,318 animals were dipped. Mr Susheel Kaushal, state president of the association, in a statement here today, alleged that the government had made the entrance tests for the selection of the JBT and TGT teachers a mockery and failed to release the final list of the selected candidates even after taking the test a number of times. He said the government had taken the JBT entrance tests thrice but failed to release the selected candidates’ list. Similarly, the selection of 514 TGTs was rejected on flimsy grounds. Demanding filling of all vacant teaching posts in the government schools for which applications had been invited in a scheduled period. Mr Sharma urged Chief Minister Virbhadra Singh to initiate the process of batch-wise appointment of TGTs as per recruitment and promotion rules. He criticised the dilly-dallying practice of the state government regarding the filling of vacant posts in government departments even after getting the clearance of the Finance Department before advertising vacancies and inviting applications from candidates. He alleged that the inordinate delay and red tape in the selection of candidates had been dismaying the unemployed youths. Hundreds of youngsters thronged the Upper Bazaar here when they came to know that leading filmstars Syed Julfi of film Pyasa and Shabir Ali of Ab Bas are in the town along with producer Ramesh Sharma. The actors and Ramesh Sharma visited various shops. Earlier, the office of AAR Movies was inaugurated here today. Ramesh Sharma said his main aim to open office in Hamirpur was to spot hidden talent and to select actors for his three films. He said that he wanted youth from Himachal Pradesh to join the Bollywood and earn name and fame in the film industry.